On June 9–11 the main event will take place in VTB Arena. And we’re ready to share the schedule of the matches with you! During these three days the arena opens at 9:00 CEST for the Pudge/Invoker/Shadow Fiend pass holders and at 10:00 for everyone who owns the other ticket types. The lobby stands will open at 9:00, so all the visitors will find what to do before the games start. 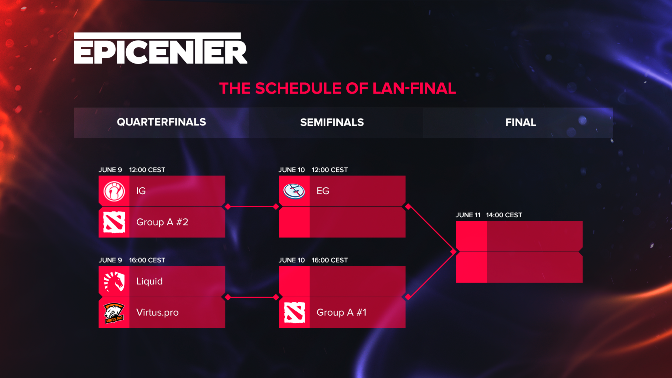 The hall opens at 10:00, and an epic opening ceremony of EPICENTER: Moscow will be held at 12:00 CEST each day. The ceremony will be followed by the matches. All the matches until the finals will be played in the bo3 format, and the finals will be bo5. The second- and third-place teams in groups are going to play on Friday. On Saturday the winners of the above-mentioned matches will fight against the group winners. You can check a detailed match schedule on the picture. Apart from exciting games, the opening ceremony on Sunday will be followed by a spectacular show match and the cosplay show final. The final match will begin at approximately 15:00 CEST. We’re waiting for anyone who’s willing attend the event. Trust us: you won’t be left disappointed!